Find out how negative thinking is learned — and how to become more enthusiastic and optimistic again. Recognize what a positive workplace looks and feels like. Uncover the origins of workplace negativity and learn how to arrest its spread in your division, department or team. Understand what makes negative people behave the way they do — and what can be done to help them change. 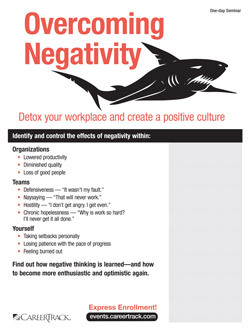 Acquire skills to blunt the effect of negative coworkers and even reverse their attitudes. Recognize negativity in yourself (in all areas of your life), and find ways to be positive and optimistic. Learn about “traveling negativity” and the steps to prevent it. Thrive and survive in a negative work environment while protecting yourself from other’s sour attitudes. What is negativity and is it contagious? The source of negativity: Is habitual naysaying a trait you’re born with — or is it acquired? Stated norms. These are the policies and messages you can see, feel and hear; they’re apparent to all employees and to the outside world as well. Unstated norms. More powerful than policies, these are the behaviors and attitudes that are passed on through tradition, management style, covert and overt actions. Unstated norms are sensed, but not always understood by outsiders.